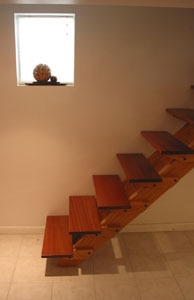 When we renovated the basement of my inlaws' house, we needed to replace the narrow rickety stair with something that was sturdy, but not visually imposing. 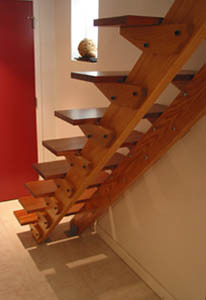 Oak is used for the stringers and brackets and mahogany was used for the treads. The brackets are bolted to the stringers with socket head cap screws and lock nuts. Since the overall rise is short and the existing floor opening was narrow, we were able to prefabricate and prefinish all of the components off site and then assemble them in place. Even the bolt holes in the stringer were drilled in the shop.